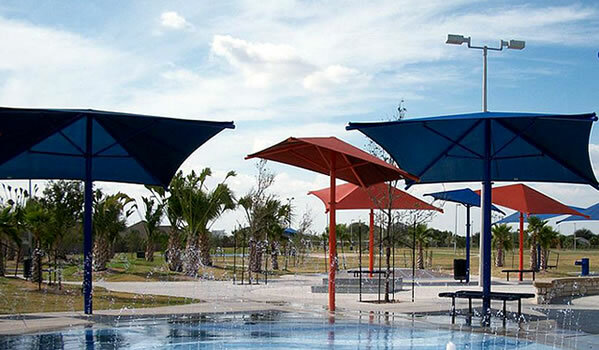 Square umbrellas shades are available with a single post. 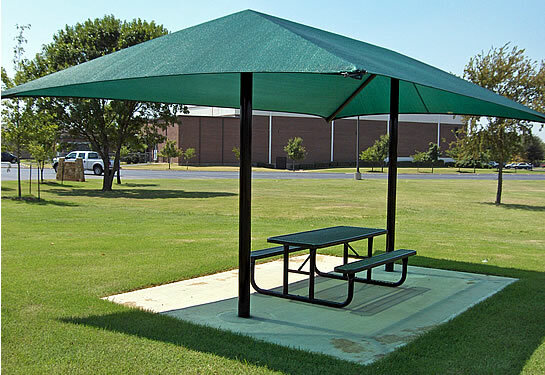 Rectangle umbrella shades are also available, but with 2 center posts. 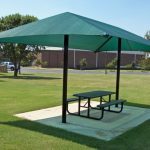 These shades are great for smaller groups and projects, with canopies available up to 24′ length and width. Square center-post shades are available in the following sizes: 10′ x 10′, 12′ x 12′, 14′ x 14′, 16′ x 16′, 18′ x 18′, 20′ x 20′, 22′ x 22′, and 24′ x 24′. The weight and thickness of the center post will vary, depending on the size canopy required. 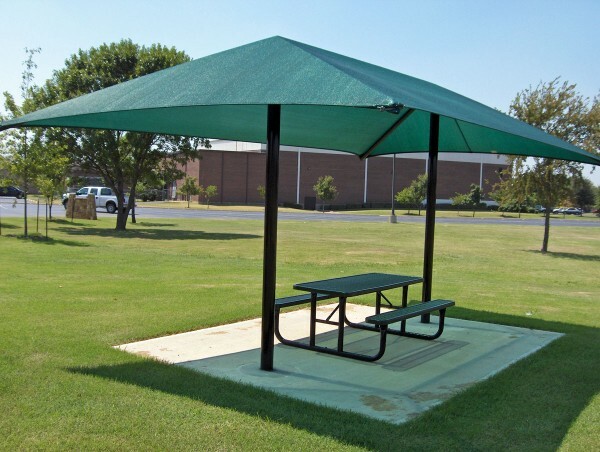 Rectangle center-post shades with 2 posts under a rectangular canopy are available in several sizes: 16′ x 12′, 18′ x 12′, 20′ x 10′, 20′ x 12′, 20′ x 14′, and 24′ x 14′. 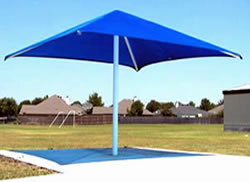 The height of a center-post umbrella is measured by the height of the outside edge of the canopy above ground level. These shades are available in heights of 8′, 10′, 12′, or 14′. Larger, custom shades are available with greater heights. Please phone us for more information about these units. Many colors available. 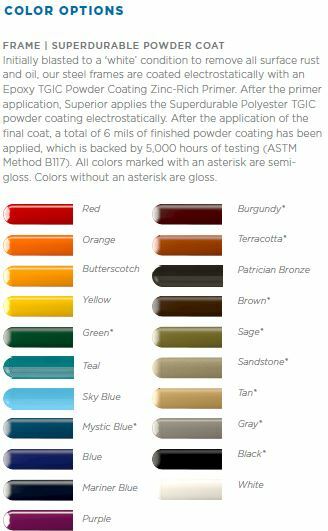 Please see diagram on above for sample colors. Many colors available. Please see diagram above for sample colors. Please note that all prices are estimated and do not include shipping or installation. List prices are subject to changes due to commodity cost fluctuations, prices shown are an estimate. It is always safer to phone us. 10′ x 10′ $1,908.00 $2,157.00 Get a Quote Now! Get More for Less! This model has 44 more square feet than the 10′ x 10′, for less than $200 extra! $2,091.00 $2,340.00 Get a Quote Now! 14′ x 14′ $2,340.00 $2,637.00 Get a Quote Now! 16′ x 16′ $2,824.00 $3,122.00 Get a Quote Now! 18′ x 18′ $3,022.00 $3,318.00 Get a Quote Now! 20′ x 20′ $3,588.00 $3,926.00 Get a Quote Now! Get More for Less! This model has 44 more square feet than the 10′ x 10′, for less than $100 extra! 16′ x 12′ $2,458.00 $2,753.00 Get a Quote Now! 18′ x 12′ $2,943.00 $3,238.00 Get a Quote Now! $2,967.00 $3,265.00 Get a Quote Now! $2,974.00 $3,274.00 Get a Quote Now! $3,049.00 $3,346.00 Get a Quote Now! $3,325.00 $3,622.00 Get a Quote Now! $2,768.00 $3,024.00 Get a Quote Now! $3,028.00 $3,326.00 Get a Quote Now! $3,066.00 $3,362.00 Get a Quote Now! $3,291.00 $3,588.00 Get a Quote Now! $3,363.00 $3,664.00 Get a Quote Now! $3,424.00 $3,722.00 Get a Quote Now! Our parent company MD Materials Playgrounds,is an American commercial playground equipment seller and installer. MD Materials Playgrounds has been in business since 1986. We pride ourselves in providing excellent customer service and supporting our local community. 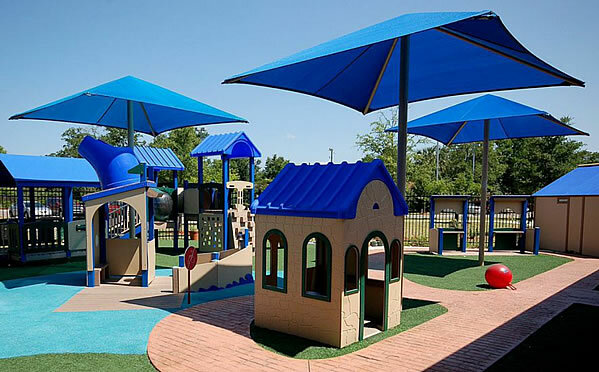 Our site offers commercial-grade shade structures for playgrounds in a variety of settings including parks and rec areas, schools, day care centers, religious organizations, homeowner associations, and more! We also strive to provide excellent customer service and expertise.